The renowned German conductor Kurt Masur once noted that an orchestra full of stars can be a disaster. Though we have no reason to believe the maestro was speaking metaphorically, his observation does suggest something more universal: Without unity and harmony, discord prevails. Many companies competing in markets that are being turned upside down by technology innovation are no strangers to discord. Today, digital reality, cognitive, and blockchain—stars of the enterprise technology realm—are redefining IT, business, and society in general. In the past, organizations typically responded to such disruptive opportunities by launching transformation initiatives within technology domains. For example, domain-specific cloud, analytics, and big data projects represented bold, if singleminded, embraces of the future. Likewise, C-suite positions such as “chief digital officer” or “chief analytics officer” reinforced the primacy of domain thinking. But it didn’t take long for companies to realize that treating some systems as independent domains is suboptimal at best. Complex predictive analytics capabilities delivered little value without big data. In turn, big data was costly and inefficient without cloud. Everything required mobile capabilities. After a decade of domain-specific transformation, one question remains unanswered: How can disruptive technologies work together to achieve larger strategic and operational goals? We are now seeing some forward-thinking organizations approach change more broadly. They are not returning to “sins of the past” by launching separate, domain-specific initiatives. Instead, they are thinking about exploration, use cases, and deployment more holistically, focusing on how disruptive technologies can complement each other to drive greater value. For example, blockchain can serve as a new foundational protocol for trust throughout the enterprise and beyond. Cognitive technologies make automated response possible across all enterprise domains. Digital reality breaks down geographic barriers between people, and systemic barriers between humans and data. Together, these technologies can fundamentally reshape how work gets done, or set the stage for new products and business models. The theme of this year’s Tech Trends report is the symphonic enterprise, an idea that describes strategy, technology, and operations working together, in harmony, across domains and boundaries. This is the ninth edition of Tech Trends, and in a way, it represents the culmination of our dogged efforts to examine the powerful technology forces that are remaking our world. The trends we discussed early on in the series, such as digital, cloud, and analytics, are now embraced across industries. Meanwhile, more recent trends, such as autonomic platforms, machine intelligence, and digital reality, continue to gain momentum. IoT sensors on the factory floor generate data that supply chain managers use to optimize shipping and inventory processes. When supply chain operations become more efficient and predictable, finance can perform more accurate forecasting and planning. This, in turn, allows dynamic pricing or adjustments to cash positions based on real-time visibility of operations. Indeed, the two functions begin sharing investments in next-generation ERP, the Internet of Things, machine learning, and RPA. Together, finance and supply chain functions shift from projects to platforms, which expands the potential frame of impact. Meanwhile, business leaders and the C-suite are increasingly interested only in strategy and outcomes, not the individual technologies that drive them. Does the convergence of finance and supply chain really seem so unlikely? Of course, some domain-specific approaches remain valuable. Core assets still underpin the IT ecosystem. Cyber and risk protocols are as critical as ever. CIO strategies for running “the business of IT” are valuable and timeless. Yet we also recognize a larger trend at work, one that emphasizes the unified “orchestra” over individual advances in technology. We hope this latest edition of Tech Trends helps you develop a more in-depth understanding of technology forces at work today. We also hope it can help you begin building a symphonic enterprise of your own. Beautiful music awaits. Bill Briggs is chief technology officer of Deloitte Consulting LLP and is based in Kansas City, Mo. 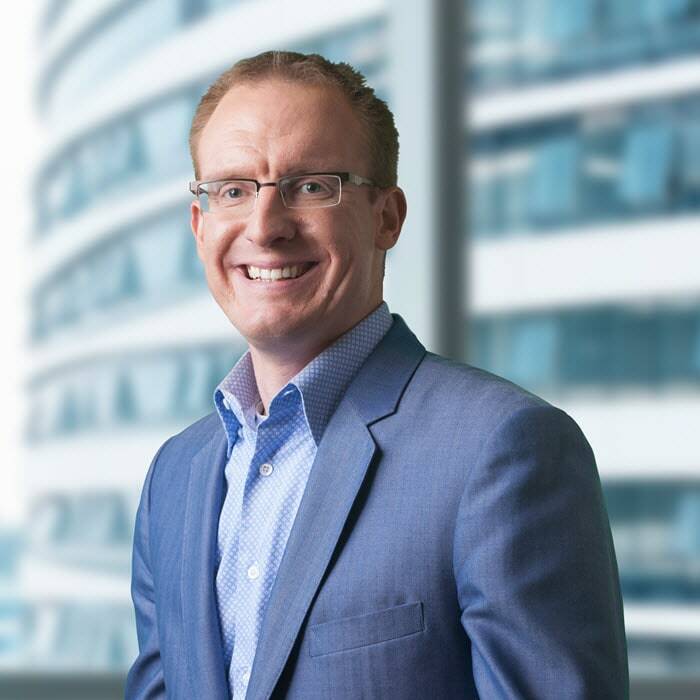 Craig Hodgetts is the national managing principal of Technology in Deloitte Consulting LLP and is based in Costa Mesa, Calif. In Q3 2017, Deloitte Consulting LLP surveyed 60 leaders at Deloitte member firms in Europe, the Middle East, Africa, Asia Pacific, and the Americas on the impact (existing and potential) of the seven trends discussed in Tech Trends 2018. Specifically, for each trend we asked them to rank their respective regions in terms of 1) relevance of the trend; 2) timeliness of each trend; and 3) readiness for the trend. We also asked each leader to provide a written perspective to support their rankings. Based on their responses, we identified 10 geographic regions in which the trends discussed in Tech Trends 2018 were either poised to advance or are already advancing: North America, South America, Northern Europe, Central Europe, Southern Europe, the Middle East, Israel, South Africa, Australia, and Asia. The countries that are represented in these regions include Argentina, Australia, Belgium, Brazil, Canada, Chile, China, Czech Republic, Denmark, Finland, France, Germany, Hong Kong, India, Ireland, Israel, Italy, Japan, Latvia, Luxembourg, Mexico, Middle East, Netherlands, New Zealand, Norway, Poland, Portugal, Romania, Serbia, South Africa, Spain, Sweden, Switzerland, the United Kingdom, and the United States. We summarized respondent perspectives that applied to each of these regions. Those summary findings and regional ranking are discussed in this report and presented visually in trend-specific infographics. Mariahna Moore for leading the charge and bringing your inimitable spark to Tech Trends. Amazing job building out the core team around you, setting (and exceeding) standards of excellence, while driving toward (and meeting!) what seemed like impossible deadlines. Here’s to a holiday season focused on family instead of risk reviews and launch plans. Doug McWhirter for your mastery of form and function, making good on our promise to spin brilliant prose from armies of researchers, torrents of interviews, and galleries of SMEs. Tech Trends 2018 quite simply wouldn’t have happened without your pen, your editorial beacon, and your perseverance. Liz Mackey for stepping into the Tech Trends fire and blowing us all away. You took the day-to-day helm and delivered in every imaginable way—with calm, patience, grace, and the right amount of tireless determination to keep the ship steady through the inevitable fire drills. Dana Kublin for continued singular brilliance, leading all things creative—the theme, artwork, layout, infographics, motion graphics, and more. Beyond your vision and artistry, your leadership and teamwork are indispensable to not just Tech Trends but the broader OCTO. Patricia Staino for making a huge impact, adding your talents with the written word to content throughout the research, spinning blindingly insightful prose across chapters, lessons, My Takes, and more. Chuck Stern for upping our marketing game, doing an excellent job with our launch planning and our broader marketing mission. While providing a much needed outside-in lens to the insanity of our ninth year Tech Trend-ing. Tracey Parry for doing an incredible job filling big shoes around external communications and PR. You brought an amazing spark to the team, while delivering above and beyond (amidst adjusting to the chaos). You’ll definitely be missed, but good luck on the adventures to come. Maria Gutierrez as you jump back into the fray with the newest member of the OCTO family, bringing your talents to not just Tech Trends but our broader Signature Issue positioning. We’re thrilled to have you back and can’t wait to see where you take us in the new role. Stefanie Heng for jumping in wherever you could help—writing, designing, shaping, and improving our content and the app. And for being the engine behind our client and market engagement around all things Tech Trends—navigating through the strategic and the underlying details without missing a beat. Melissa Doody for expanding your role and impact, making your mark across creative and design. Looking forward to seeing your influence grow as you become a seasoned Tech Trends veteran. Deniz Oker and Nick Patton for the tremendous impact made in your inaugural Tech Trends effort—helping coordinate research, and diving in to help wherever needed. Thanks for everything you did to make Tech Trends 2018 our best one yet. Mitch Derman for your great help with everything from internal communications to our latest round of “Five Minutes On” videos. Matthew Budman, Troy Bishop, Kevin Weier, Amy Bergstrom, and the tremendous Deloitte Insights team. Tech Trends wouldn’t happen without your collaboration, your editorial brilliance, and your support. You help us raise the bar every year; more importantly, you’re a huge part of how we exceed those expectations. Introduction: The symphonic enterprise has been added to your bookmarks. Introduction: The symphonic enterprise has been removed from your bookmarks.